What next for the Police Commissioner model? A future commissioner or a model for disaster? 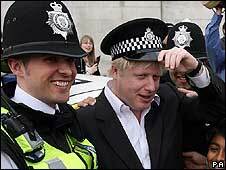 The last few weeks haven’t been kind to the police forces, especially in London. First there was the phone hacking scandal that led to the resignation of the Commissioner and Deputy Commissioner of the Metropolitan Police. Then there were riots on the streets of London and other major cities which the police were seemingly slow to react to. In light of this one of our favourite guest bloggers asks what the effect of the past few months might be on the Government’s proposals for elected police commissioners. The Police Reform and Social Responsibility Bill 2011 is proposing to replace Police Authorities with directly elected Police Commissioners. The soon to be replaced police authorites are currently comprised of local government Councillors and co-opted Independent Members. At work a couple of months back I speculated with a colleague about whether the Police Bill might suffer the same procedural delays that the Health Bill had. His view was that it was less controversial with the public and the political classes. That was in the Spring and of course, the police have since had a roller coaster few months. First the public opprobrium arising from the phone hacking scandal and now public concerns about civic unrest. My question is have these two events impacted on the debate regarding the elected police commission model?